Well that can be quite funny to Create a funny face - Osama bin Laden joke. This is funniest effect I have seen on this website. If you will try it out once, you will laugh crazily out of the image you will get. Put the photo as your profile pic on any messenger or social website and you will get hilarious comments over it. Thats Osama Bin Laden in the picture and getting into his face seems hilarious to me. 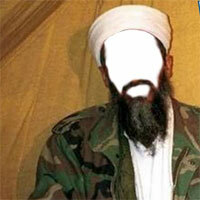 Get your pic in the same light and camera settings and you will fit into Osama's costume to have fun.